Gnocchi, a simple pasta made from potatoes, is one of my favorite things to make. I learned how to make it from an old Italian couple that I worked with many years ago. They owned a restaurant in Italy at one time. When I first made gnocchi for Jackie, she adored it, but she always giggles at the way I pronounce the word. Jackie, my ever so beautiful documentarian (with a very endearing nerdy side) likes to pronounce “gnocchi” it with a certain Italian flair. I, on the other hand, Americanize my pronunciation: “knock-y”. However you choose to say it, this stuff is good. And this recipe has become one of our favorites. It is sweet, yet savory and ever so decadent. 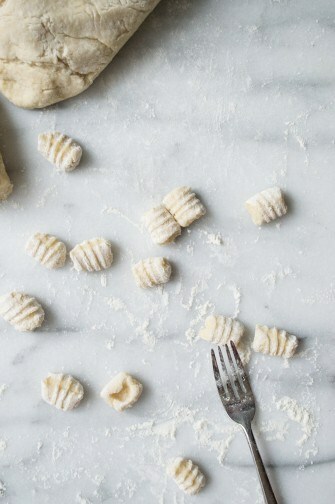 Making homemade gnocchi may seem intimidating, but it is really quite simple. It is also a great project for the whole family. The dough is very easy to make, and the rolling and shaping of the pasta is simple enough that the kids can do it. You can spend some time making a large batch and then freeze enough to make many, many meals. We love gnocchi every which way, but for this recipe, we created a rich, creamy sauce sweetened with sun-dried tomatoes and fresh basil. It really hit the spot. How can you not love a pasta made with potatoes? I crave this stuff quite often, which is why I make enough to freeze. 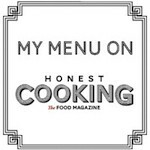 It enables me to make quick, delicious dinner in less than 15 minutes. We hope you enjoy this family favorite as much as we do. An easy pasta dish made from potatoes that can bring families together eating it and making it. Add 1½ cups flour to start. Add egg, egg yolk garlic powder and salt and pepper to taste. Convert dough to counter dusted with flour and knead dough until smooth and not sticky. You may have to add flour to create. Cut off small portions and roll out to form ½ inch rope. Using a fork take each piece of dough and roll the dough down the fork while pressing in with your finger to " hollow the inside". Continue until all dough is rolled. At this point arrange all gnocchi on a baking sheets. In a large saute pan melt the butter and mix in flour and cook over medium heat for 3 mins stirring often. Wish in milk until flour and butter mixture is combined. Turn heat to medium -low and allow to thicken, whisking often. Dice fresh basil leaves and add to sauce and mix. Add gnocchi about a cup at a time. You must know that this recipe is superb! It even tastes awesome the next day. Making gnocchi is a mess but well worth it. Have you ever pan-fried it after boiling it? If not you should try it 🙂 Anyway, this recipe is perfect as is, but I had mushrooms on hand and added those as well!